I have no idea what this is in my worm bins. I have taken all my worms out - cleaned the bins - and put when worms back in. Within a week these "shells" are attached to the top of the worm bins. They don't seem to hurt the worms. I am also having a lot of trouble with mayflies and gnats. Could you please help!! Thanks for the photos. You definitely have a fly infestation. This is caused from too much nitrogen or kitchen scraps being added to the worm bin. Flies, along with many other insects, are attracted to the nitrogen-rich food source. 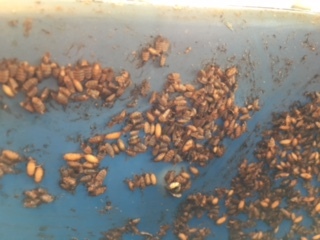 So what do you do to get rid of the flies and how do you keep adding the scraps in the future, but still keep the flies down? This is one of the reasons it's important to feed a mix of carbon and nitrogen. 1. Take out as many big pieces of scraps as you can. 2. Add plenty (3-4 inches) of dense, moist shredded paper or cardboard. Anther option is coco coir, but not as easily available. 3. Cover everything with a few sheets of moist newsprint and let it sit for a couple of weeks. 4. Make sure the worm bin is NOT too wet, but only moist. 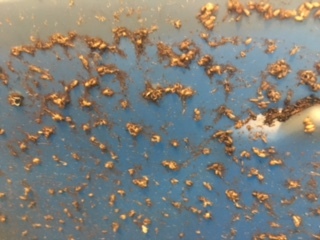 Fly maggots, like the ones stuck on your walls (which look like fly cocoons), like a wet environment. The carbon will continue to feed the worms while starving the flies and other nitrogen-loving pests. Keep it moist and not wet at all times. You should always keep a carbon to nitrogen C:N ratio at 20:1 or higher. You can up the nitrogen and only feed worms the scraps when you see the old scraps almost completely gone. In the future, bury the scraps under the carbon bedding and/or worm castings by a few inches to avoid attracting pests as much as possible. You'll need to wait a couple of weeks for all flies to complete their cycle, but as long as the scraps are disappearing, the flies should too. For faster results, applying Diatomaceous Earth (DE) will also help and a combination of both DE and what's stated above will be a remedy and proactive. What Is Diatomaceous Earth and is it Safe for Worms? 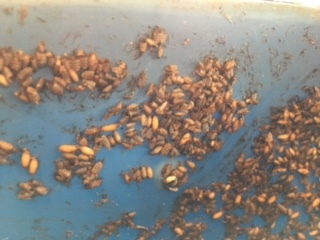 Also please take a look at the page dealing with pests in the worm bin. Although many organisms, as you have stated Louise with the fly infestation, do not pose a threat to the worms. 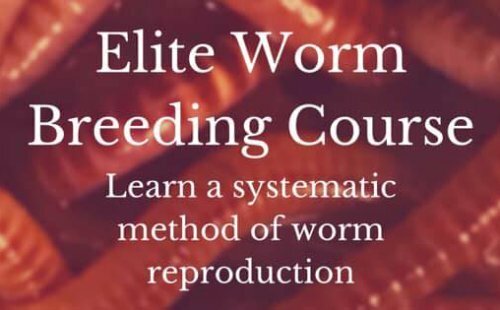 However, When there are TOO MANY, the worms will not want to compete for the food and will leave, go way down to the bottom, or begin to die off. Thanks so much for getting back in touch with me so fast. I had spoken to several people concerning this problem and no one gave me a logical answer - until you! I am going to go as you said and I hope this will take care of the problem. I do not have any large pieces of food in their bin, but I do not have enough newspaper in the bins. I will let you know in a couple weeks how this works. Thank you once again for being to prompt and knowledgeable.